MyCRM Blog | Are you still running an older version of Microsoft CRM? As we all know when a business system works and works well, as a business owner you are very reluctant to change or upgrade. After working in the CRM market for nearly 20 years, and seeing great implementations run and run. The reluctance to migrate or upgrade leads me to recognise from experience that there are still organisations running older versions of Dynamics CRM. In the last 6 month we have seen 5 organisations come to MyCRM with Legacy v4 CRM databases and seen 3 customers come with 2011 databases, it has been a busy few months for the team. Why would they pick MyCRM? All of these prospects had one thing in common, they wanted to move to cloud or online managed services, as they no longer had the appetite to support an infrastructure and servers in house. With quick realisation they understood that they could not just move to Microsoft 365 by uploading a database and have it converted to the latest version, but that an upgrade would mean a complete rework or start over and more investment. In discussion with each customer this had created a feeling of panic, fear and over all delay in the decision making process. MyCRM have for the past 10 years been able to offer a range of managed CRM service bundles to customers across the UK and EU and offer a unique blend of CRM support, development and general advice to help organisations meet their requirements and get the best result from any investment made. 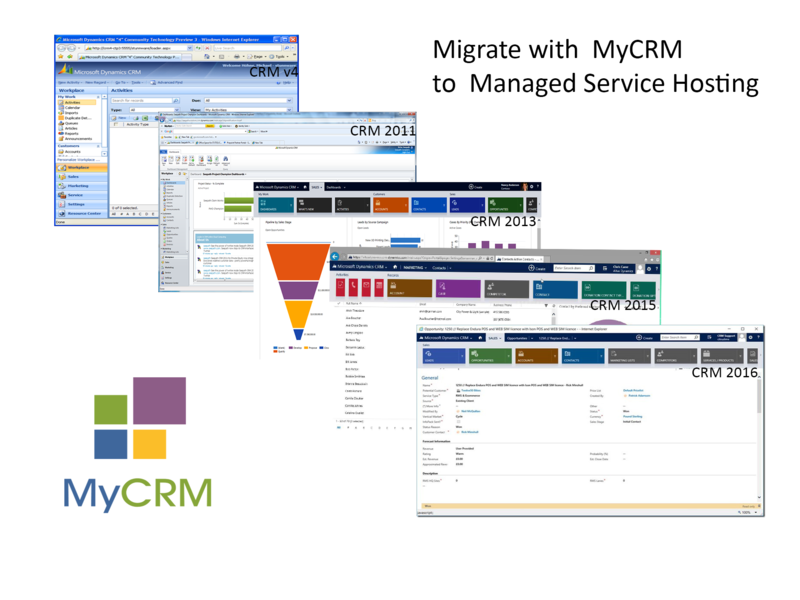 You can contact MyCRM here http://www.mycrmgroup.com/Contact to see how we can help move your legacy CRM solution to a cost effective managed service. Our team work as a one stop service provider help you achieve the best results from your CRM solution.